As you know, Joe Humphreys was honored on Thursday evening, and as I didn't know, many of our readers are not familiar with Joe and his accomplishments. Joe being an American legend, more than a few overseas readers asked to know more about him. Joe is well known in these parts as not only a passionate fly fisherman, but an educator, author and conservationist. He has authored two highly acclaimed books, Joe Humphreys Trout Tactics, and On the Trout Stream with Joe Humphreys, as well as many articles in regional and national periodicals. He has also hosted a fly fishing series on a nationally televised sports channel, and he has been featured on three fly fishing videos (The Fly Fishing Series), and produced and been featured on four very well-received videos. Joe has taught fly fishing for more than forty years, including directing Penn State's angling program for nineteen years. I have been fortunate to live in the Northeast, where until recently, Joe participated in many of the same fly fishing shows that I also attended over the last 20+ years. He has always been tireless and generous, sharing his vast knowledge of fly fishing for trout with ease. So those are just some of the reasons why Lafayette College and the US Youth Fly Fishing Team honored Joe, If you ask anyone that knows Joe, they will tell you there's a lot more to the story. He has touched the lives of many individuals, and they all likely have a special story about Joe. 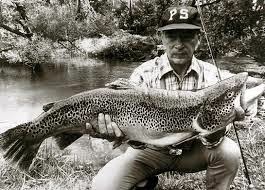 In 1977, Joe caught a 34 inch, 16 pound, brown on a Pennsylvania spring creek late one evening. It is the largest non-lake run brown trout caught on a fly in the state. Here is Douglas speaking at the event about his first encounter with Joe at one of the fly fishing shows. It had a lasting effect, Doug's passion for fly fishing rivals anyone I know. Here, Steven Ketterer, a commissioner of the PA Fish & Boat Commission presents Joe with a painting of Joe walking along a stream, mentoring a young man. Next up are some of the fine members of the US Youth Fly Fishing Team and the man himself. L-R Alex Rundella, Joe, Doug Freemann, and Rob Funk. It was a wonderful evening thanks to the folks at Lafayette College (Leslie, Patricia and Diane), and the US Youth Fly Fishing Team. And finally, a big thank you to Joe. If I have even half the impact that you have had on the folks whose paths you have crossed over the years, I'll be content...........and like you, I'll always shoot for more. that is one monster fish HOLY COW!! !